The Truth of Existence is ultimately simple and never absent. It could not be otherwise. Sri Ramana used to say that the Eternal Divine nature cannot be present at one time and absent at another. So we must become aware of our Self in this present moment. It is only in the present that the Self is Realized. That is because the very nature of the Self is Pure Presence. It is Pure Being. Truth is always Self-Seeing and Self-Being. Self Sees It Self by the power of its own inherent Truth. It needs no external agency for validation. You do not need anyone to tell you that you exist. You know you exist. Your existence announces itself perpetually and continually. That is the nature of the Self. It is unbroken and the whole mass of Awareness-Existence-Bliss. In Sanskrit, we refer to it as Sat-Chit-Ananada. Advaita says that Self is the Truth and it is One without a second. There is no second outside of this One to verify its existence. The Truth is only found by turning within. It cannot be found looking anywhere other than where you are in this present moment. The great Realization is that the Seeker, the one who seeks the Truth, ends up knowing that He/She is the Truth It Self. That is the end of seeking. Where can you look for the Truth when the Realization dawns that you are already rooted in the Truth of Existence. We are already the Truth. There is nothing to gain which can add something to our original nature. We must See this with our inner Eye. This knowledge is not objective knowledge. This knowledge is purely subjective. That is why we call it Self-Knowledge. It is not the knowledge of objects of perceptions. The best one can say is that It is only what One Is. Self is Always Self-Awake and complete. The awakened and quiet mind is able to recognize the Self shining through clearly. It is only Self-Recognition through the medium of the mind. The mind identity that arises out of the Self, and that is of the nature of Self in essence, has the feeling of limitation and weakness due to identification with the body. Many explanations are given for this such as Karma, Maya, etc. So the practical instructions of the sages emphasize contemplation on the essential nature of identity and existence. This method is known as Self-Inquiry. It involves inquiring into the nature of one’s own being and existence with conviction. Without faith one can never jump into the arms of the Divine Beloved. We do not have enough personal strength to go into the unknown. The personal identity cannot step into the unknown without faith. To allow that final surrender to the Divine to take place at all is called Grace. Faith allows for total and immediate availability to the Divine, which ultimately is nowhere other than in one’s own Self. Without faith, one speaks eloquently of water but does not take the drink and remains thirsty. 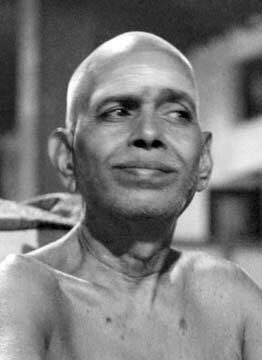 Sri Ramana pointed out that any “doing” with the mind presupposes the retention of the mind. It is this very nature of “doing” that preserves the ego identity and does not allow the conscious sinking of the mind into the Self from where it arises. There is no antidote to this except for faith. The complete acceptance of things as they are (not my will, but Divine will), when it permeates meditation and life, undermines the resistance of the mind. Faith is important. It evokes Grace. It is the preface to Grace. What is, is you. Self is Realized in the Present as Pure Presence. It is only your own Eternal Presence. If you pay attention, Self reveals It Self as your own Heart of Awareness. Sometimes we see people debating the language and methodology of Sri Ramana’s teaching. 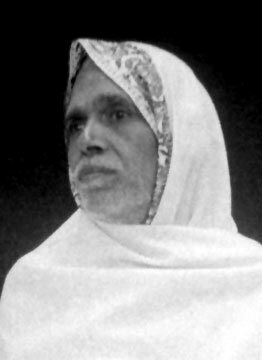 The question is often raised, “What is the purest form of Ramana’s teaching”? The answer is obvious. That form of the teaching is the purest, which works for you. What bring you to Self-Knowledge and Self-Realization is the highest teaching. 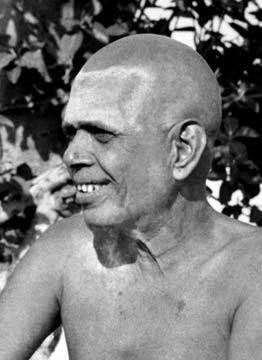 Sri Ramana’s teaching is very straight forward. Despite the volumes of books and hundreds of expert commentaries, the essential teaching is simple. It is all an open secret for everyone to see. Sri Ramana always emphasized that our nature is that of pure, unstained consciousness. 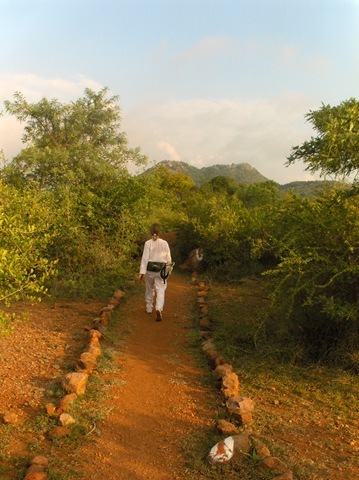 “Awareness is another name for you”, the Sage of Arunachala used to say. Our spirit is of the nature of unbroken awareness that continues regardless of what our physical makeup is or what mental state the mind is in (sleep, dreaming, waking). If we deeply understand this, we have arrived at the central truth of the teaching. Sometimes the students of Advaita debate which words or terms best describe the process of inquiry. Those who know the nature of the Heart directly become indifferent to argumentation and do not quibble over trivialities. All of these terms, self-attention, self-awareness, self-remembrance refer to the same process of the subject turning within to itself, the subject. Self-inquiry focuses the mind on its source and the result is clarity of awareness. Awareness by its very nature is always aware of itself but it is not an object to itself. We cannot understand this except by being in the Heart of Awareness and being the Heart. In the world of duality, Oneness can only be indicated, but it cannot be known. Oneness cannot be known in duality because it cannot be an object to itself. Oneness cannot be known in duality because it swallows up duality. To know the Oneness intimately, one has to become That and to recognize One Is That! Do you see the beauty of this paradox? Sri Ramana used to say that there are not two selves where one self is aware of the second self. Similarly there are not two forms of awareness. However, through the duality and agency of the perceptual mind, we can say that awareness being aware of itself is a refined and a subtle form of atma vichara (Self-Inquiry). Ultimately, even this duality, being that of the mind (that any method necessarily presumes), vanishes as One Awareness shines forth as the Self that is the Heart; that the ancients termed Sat-Chit-Ananda. Existence-Consciousness-Bliss. One whole mass without divisions. Once Sri Ramana said the whole truth is contained in the words”Be Still”. So if one is self-aware and still, one has grasped the method. A quiet, peaceful, and content mind that is awake and turned within to its source has grasped the method and the process of Self-Inquiry. This process itself turns into the goal when the mind merges into the Heart for Self-Revelation. This was posted many years ago in 1999 on the HarshaSatsangh yahoo group by a disciple of Poonja-ji (also known as Papa-ji). 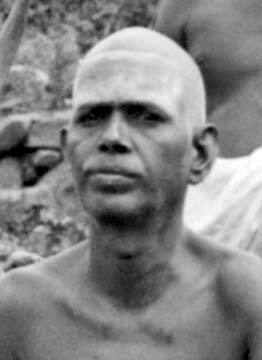 Poonja-ji received instructions from Sri Ramana in the 1930s and considered himself a disciple of Ramana. Poonja-Ji, spoke the following words in the beginning of Satsang 26/11/1992. OM. Let there be peace among all beings of the universe. Let there be peace. Let there be peace. Om shanti, shanti, shanti. Namaskar, namaskar. Behold the inner flame, eternally ablaze within the cave of your own heart and in the hearts of all beings. Number 1: Absolute dedication to it. Number 2: Complete abandonment of all the desires which you have hitherto opted for and which have not given you satisfaction. Number 3: Enquiry into the nature of Self. These are the three ways to know who you really are. What is this shining in your own heart? Call it Atman, call it enlightenment, call it freedom. Any one of these ways is quite enough. Without this you would not be attracted to it. This is your own beauty, your own love, your own light. Over two years ago, I had started using Windows Live Writer with my wordpress blog. I even complimented Microsoft on making the Live Writer open enough to interface with other services like Google’s Blogger and also WordPress.com. I suggested that the strategy to be more compatible with blogging services other than simply Microsoft’s own was a way to create some goodwill in the technology community and remain competitive with Google. For a while, Microsoft seemed to follow through on their open strategy. The Windows Live Writer was made compatible with not only other blogging services but also with the Firefox browser which competes directly with Microsoft’s Internet Explorer. Unfortunately, Microsoft’s early largess proved to be unsustainable. Windows Live Writer stopped being compatible with Firefox 3. At least that has been my experience. So much for Microsoft’s brave new vision to be more open to open source. Now, in order to use Windows Live Writer, I have to use the Internet Explorer. I have not been doing that and instead am using wordpress’s own native menu which I am not fully used to. Recently I thought about giving up and going back to Windows Live Writer by simply using the Internet Explorer. I may do that but don’t like to have my option of which browser to use restricted by the availability of a blogging client. So I am experimenting with ScribeFire as my new blogging client as it is made especially for Firefox. I hope the learning curve will not be too steep. This post is written using ScribeFire. So far so good! 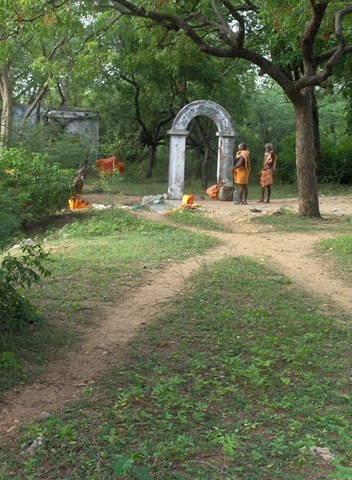 The first posting shows the start of the walk from Sri Ramanasramam. 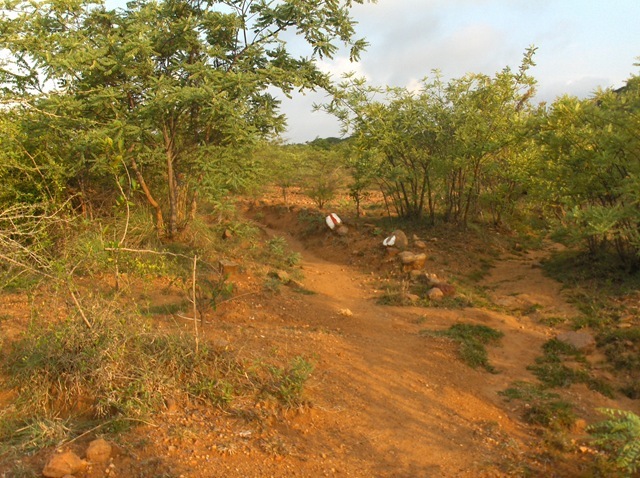 This posting continues with the walk where the initial posting ended, from the path near the access point where Perumpakkam Road meets Bangalore Road. 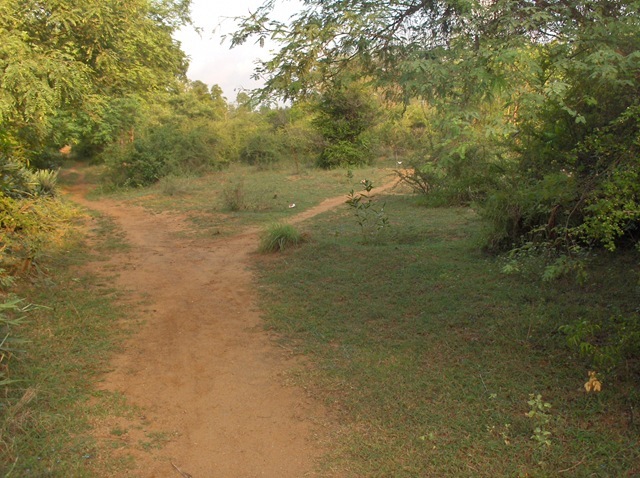 This is the place where many walkers enter onto the Inner Path. 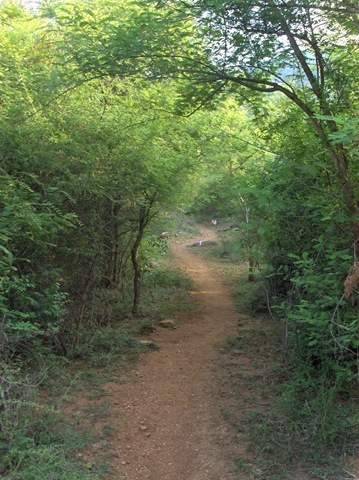 This part of the Inner Path goes by the path up to Aum Amma’s and Papaji’s caves, by the Sadhu Tank, and ends at the Arunachala Reforestation station. 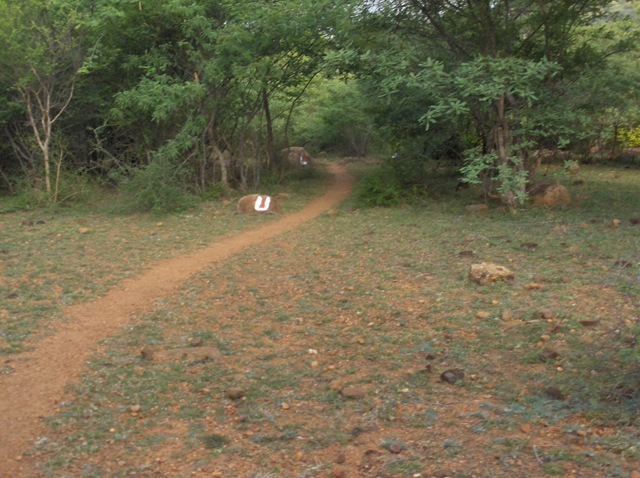 Previous postings show areas that can be reached while on this part of the Inner Path. Postings about Papaji’s cave can be found here and here. 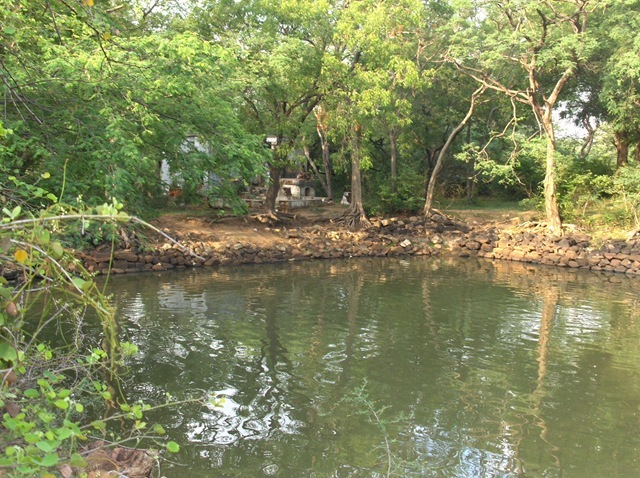 Aum Amma cave is shown here. 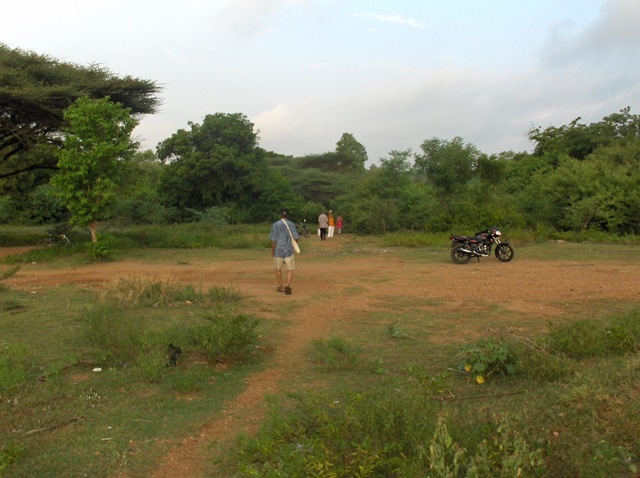 A posting about the ‘Holy Feet of God’, Tiruvadi, South of the Sadhu’s Tank, can be found here. 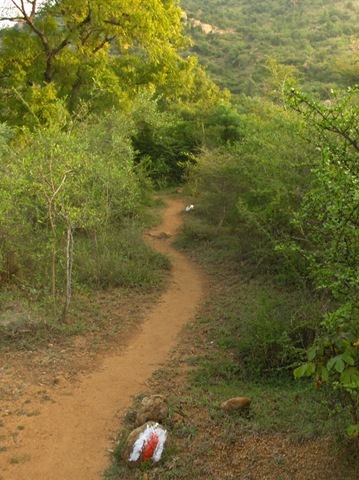 A map of Arunachala and the Outer Path is below. 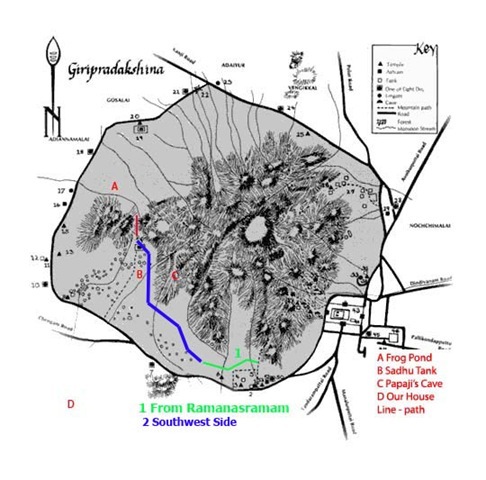 I have marked this map with a few landmarks we use, and with an approximate map of the first two sections of the Inner Path pradakshina (girivalam in Tamil) shown in this series. The Southwest section of the path is in blue. The path starts after you go through the stone ‘gate’ leaving the first section. There is a ditch you walk through on the other side where the path starts. If it is full of water, there is an alternate to the right. 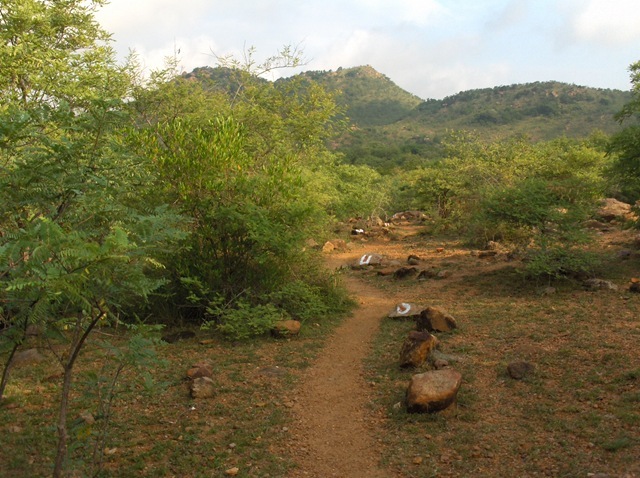 Looking to Arunachala through the trees before we start walking on this section. Most of these photos were taken on a Sunday, and there were a few other people walking the path, including an elderly Indian couple that have lived for the last 30 years in Saratoga California, near where I lived, and who have heard of my spiritual teacher, Nome. Many times during the week we will not see another person walking the Inner Path. 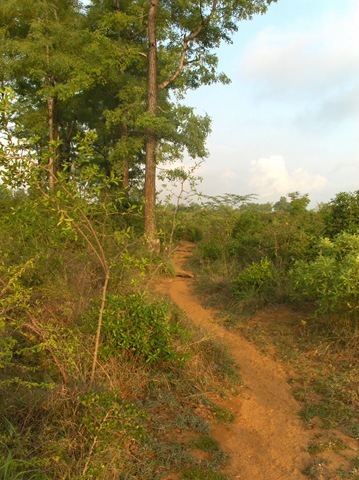 The path start winding through an area where trees provide a canopy. The path branches to the right here. Do no go straight here; you will go back to Bangalore road. 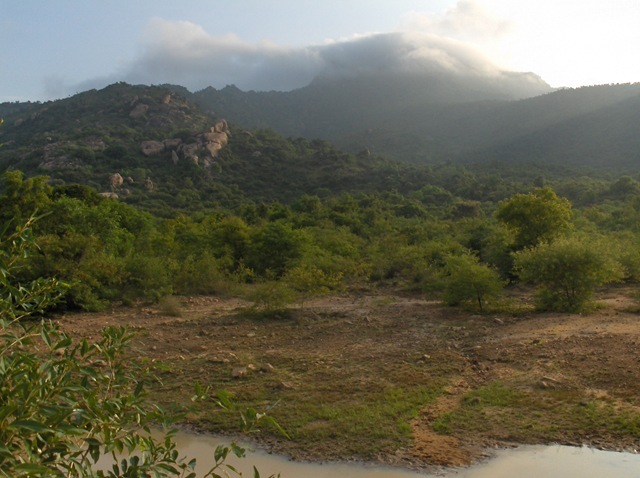 Arunachala, the peak enshrouded in clouds. 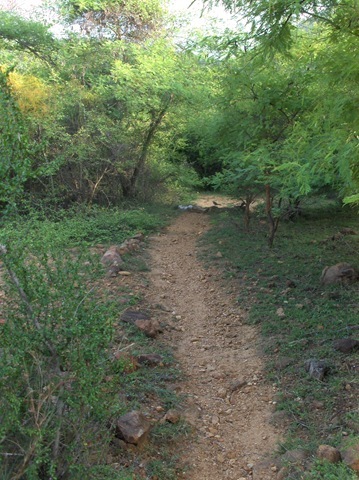 The path in gentle here, winding through trees towards the mountain. Now the path has turned East. The tall trees on the right were planted I think 10 – 20 years ago. There were many of this kind of tree planted in this area, and on the Northeast side of the hill. Winding through this countryside. 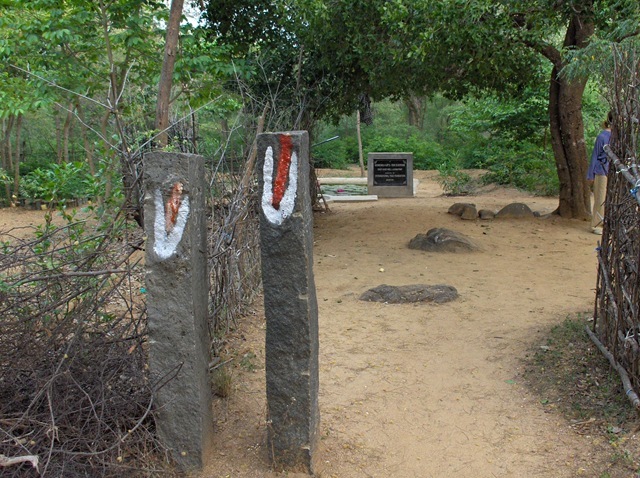 The red and white paintings are trail markers painted on stones. 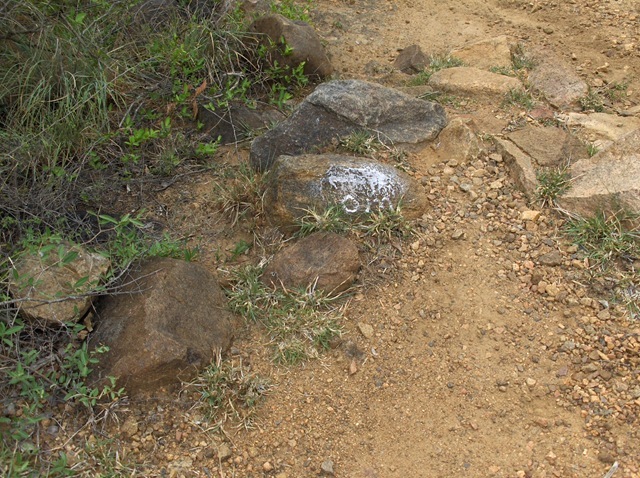 These are found all the way around the mountain to mark the Inner Path. 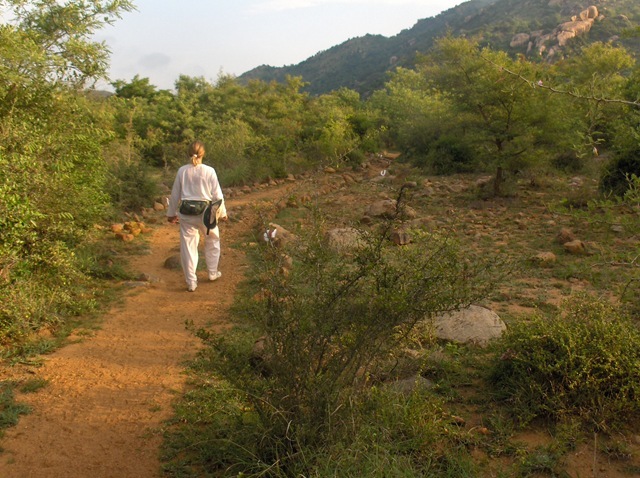 Following these one should not get lost – just keep Arunachala to your right and keep walking. 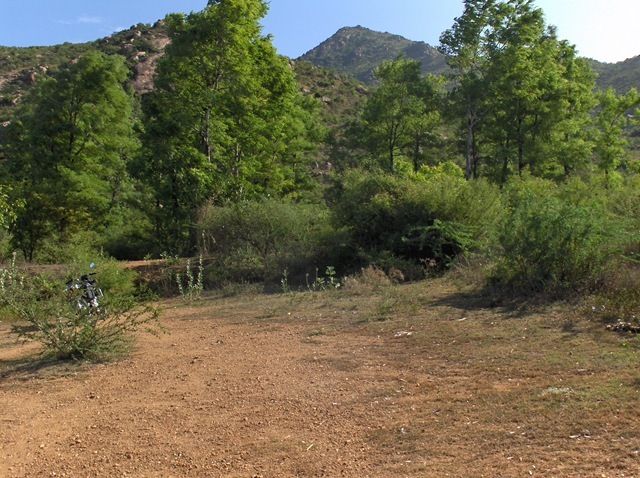 Now the path has turned back towards the mountain. It is more rocky here. Carol walking ahead of me. 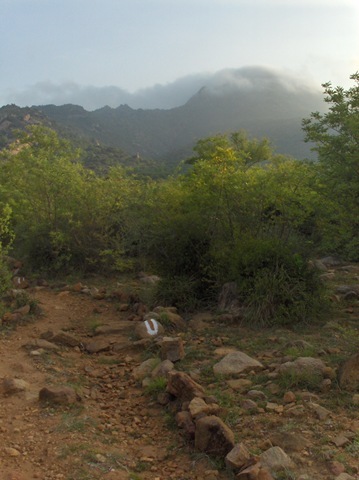 Arunachala from the Inner Path, clouds at the top. 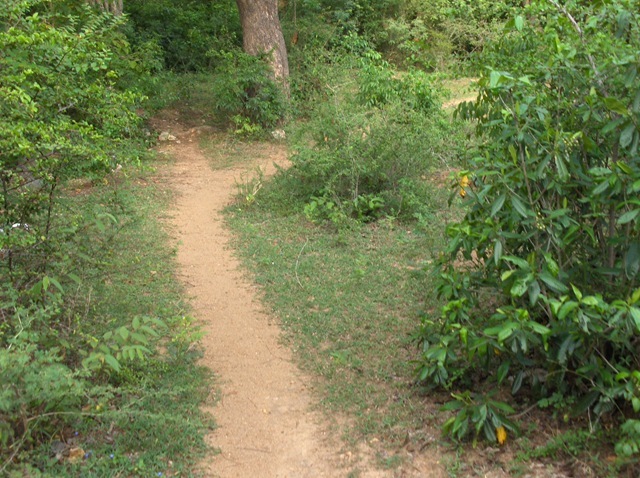 Here is a marker for the path to Aum Amma’s and Papaji’s caves. Follow the path up the hill. Have good shoes, this is rocky and steep in parts. 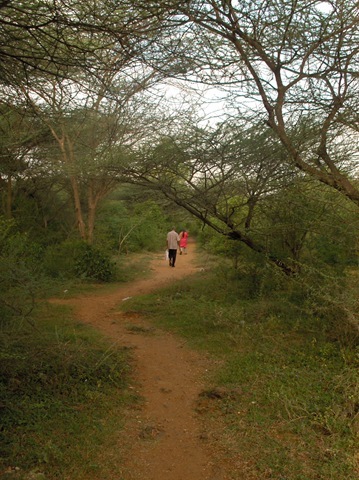 Continuing along the Inner Path. 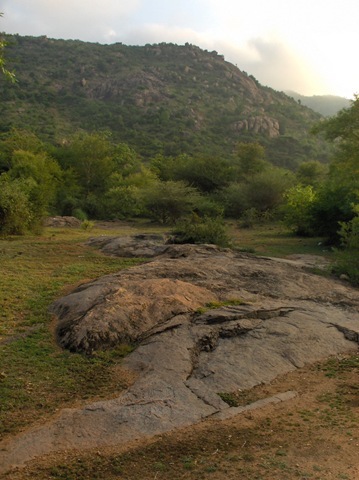 Now Parvati Hill, the small hill on the East end of Arunachala, with its two small peaks, is visible. 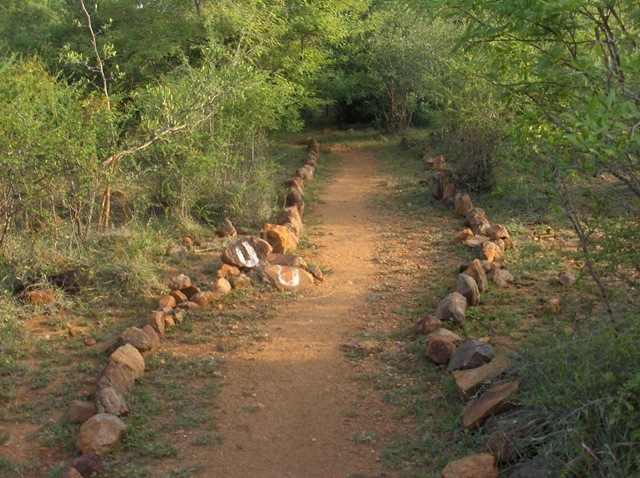 Note the stones lining both sides of the path. These are common in this section of the path. You will see them in many of the photos. 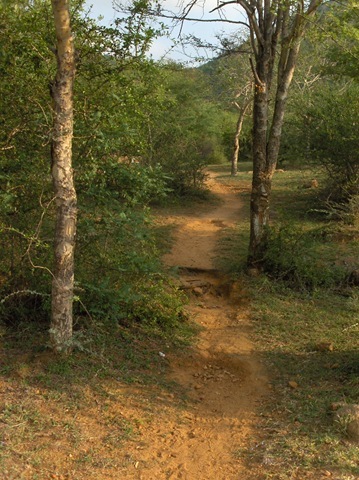 Parvati Hill, looking of one of the several small lakes found in this section of the path. These are behind earth berms, and I think are intended to help bring water back into the underground water table. 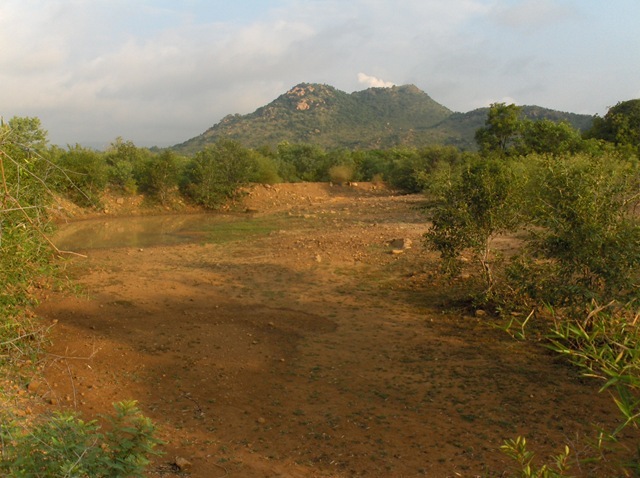 It is early monsoon season now, and there is some water in this tank, which has been dry for the summer months (starting in April). Again Arunachala in the clouds. This is from the berm shown above. 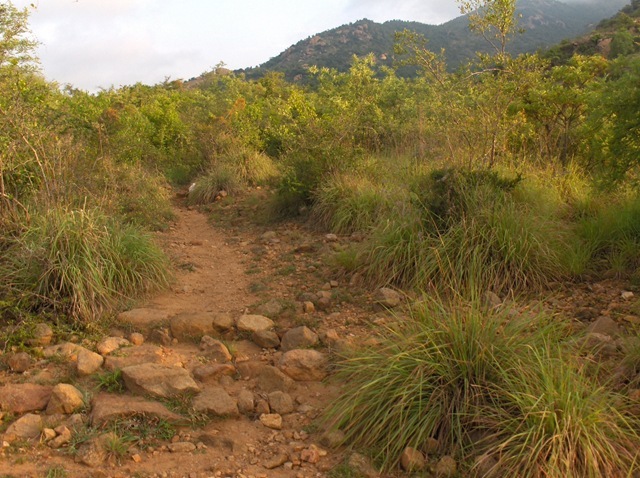 Part way up the mountain, on the left side of the photo, a big rock formation is visible. 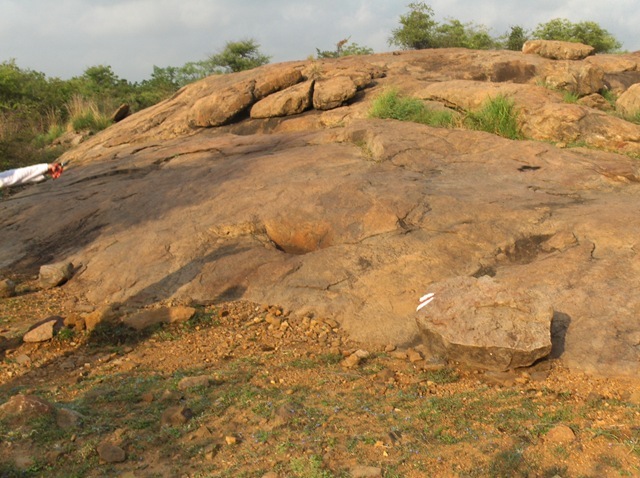 This is where Aum Amma’s and Papaji’s caves are found. The path is pretty here, and lined with stones on both sides. Now winding through more trees. When the sun is out, these trees are much appreciated. Any shade is welcome. White and red trail markers are visible in the distance. Coming out of the trees, Parvati Hill is again visible. Now to the right of the trail is a big rock. Often, in the tourist season, you will see groups, sitting on this rock. 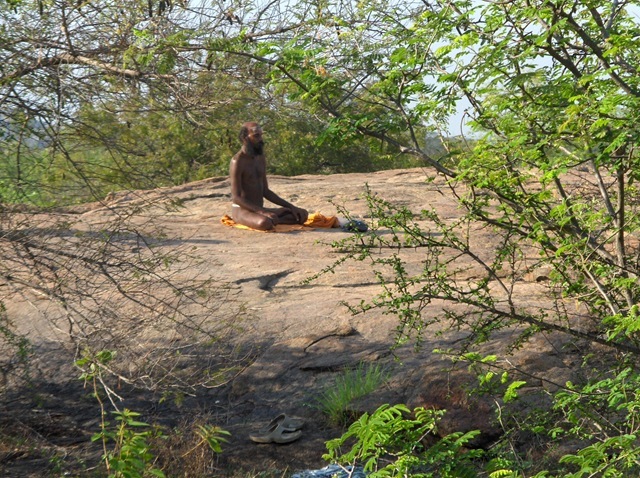 Early in the morning, you also may see a Sadhu, meditating. And finally we come to the Sadhu’s tank. This tank is, I am told, spring fed. What I have seen is that it has water all through the year, while most other tanks will dry out. 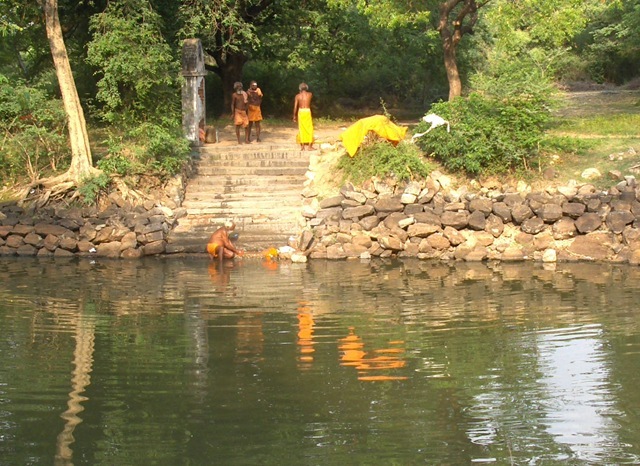 It is early in the morning, and there are Sadhu’s bathing, washing their saffron cloths and spreading them out to dry. On the other side of the tank, there is a picturesque masonry arch, and a falling-down building. This is where we saw the Sadhu bathing in the photo above. Now we follow the path once more through some trees. 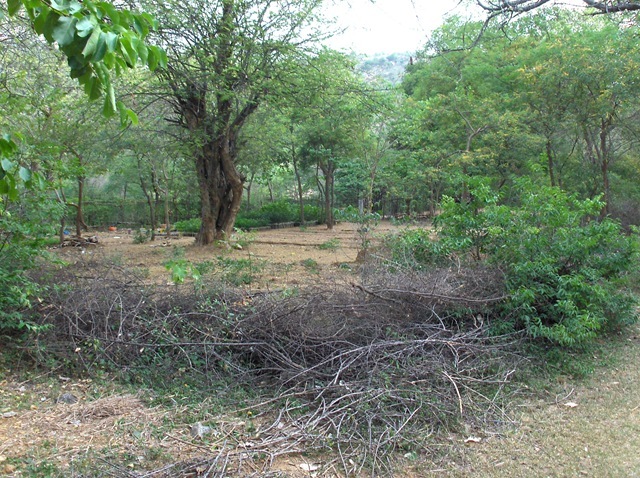 And we get to one of the Reforestation Project’s tree nurseries. Here is another stone gate, which marks the end of this section on the Inner Path. The next part of this series will start from here. Realized Sages such as Bhagavan Sri Ramana have indicated the experience or the state of the Self. It is what it is. It is the Heart of Existence, and Existence It Self. Sri Ramana used to say that It is only Being. You can call it what you like. Self, No-Self, Shunya, Reality. What difference can it make? The ultimate Reality cannot be named. It has no name. There is no one outside of Reality to give it a name. Ancient sages taught that the core of our being is pure Sat-Chit-Ananda which roughly translates from Sanskrit as Existence, Knowledge/Consciousness, Bliss as One. It is devoid of thought or doubt or conflict, but utterly complete and supreme over its domain, its domain being no other than It Self. It is the Eternal Reality which is not conscious of anything separate from it, being Pure Consciousness Itself. It is beyond happiness and despair, destiny and free will, and beyond time and space. It is beyond the different paths, philosophies, religions and conceptions of the Divine. All of these concepts are play of the mind which sees differences everywhere. People with much confidence speak of their way, their path, and their religion. People speak of their God, their insights, their Realization, etc. This is all fine. Self-Inquiry starts when an aspirant sincerely inquires with intensity, Who is this “I” which conceptualizes all such things. The root question in Self-Inquiry is “Who Am I?” That is the method taught by Sri Ramana Maharshi for reflective Self-Inquiry. Real introversion of the mind can only take place when we look directly for the source of our very existence. The feeling and sense of “I” or “Me” that everyone has naturally, is the clue to resolving the mystery of Existence. Where does this sense of “I Am” comes from. Looking within and following this sense to its source leads to the Knowledge of the Self.